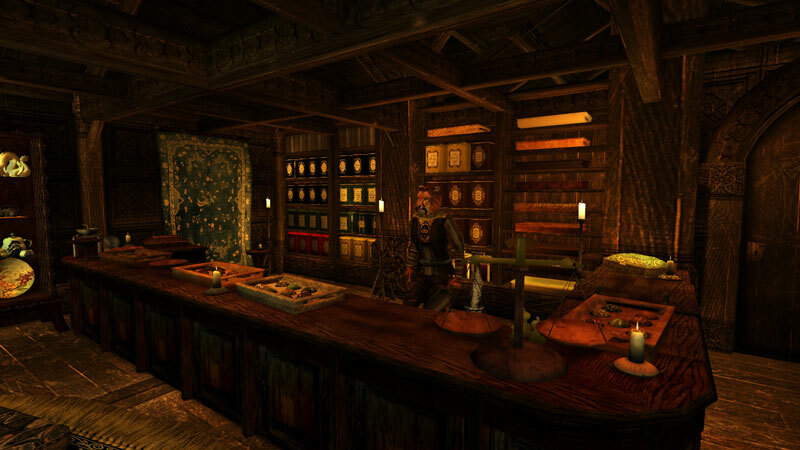 The original tea shop, found outside Ebonheart. The tea shop sells 30 kinds of tea, 6 kinds of coffee, and more. Over 20 new tea sets are for sale, as well as tea tins, platters, and more. 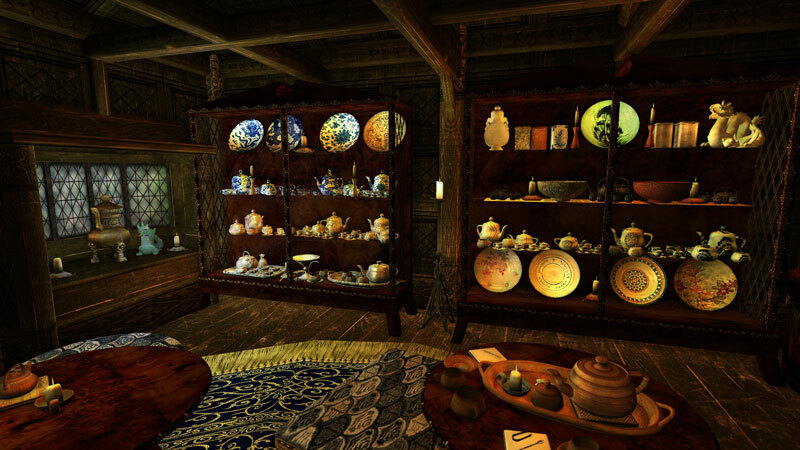 The Ebonheart shop boasts a large selection of fine china and Akavirian imports. Sheema not only serves tea, but bakes goods daily. 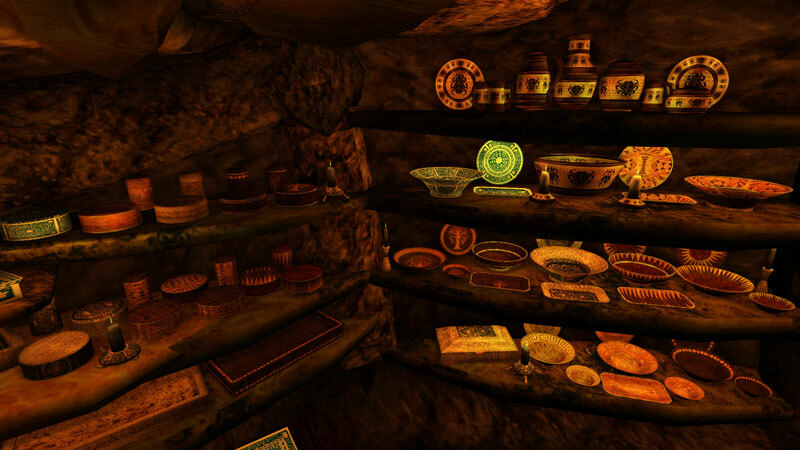 The Tel Mora tea shop has an all new selection of items to choose from. 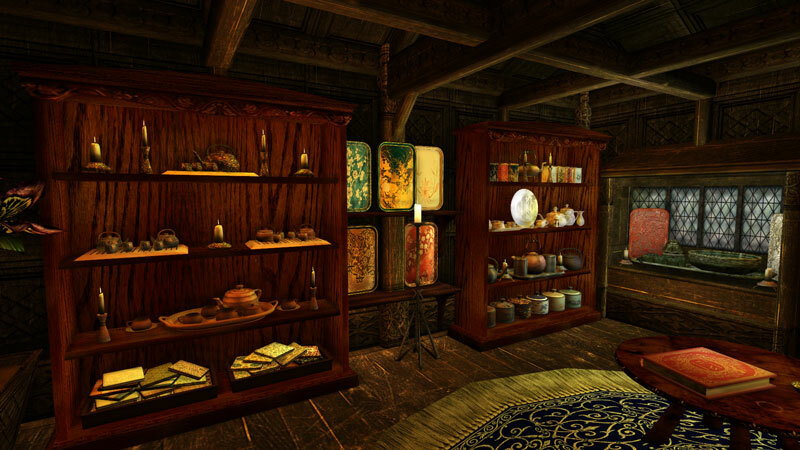 The Tel Mora shop sells all the same teas you can find in Ebonheart. All new meshes include new tins, dishes, and a complete bug-design set. 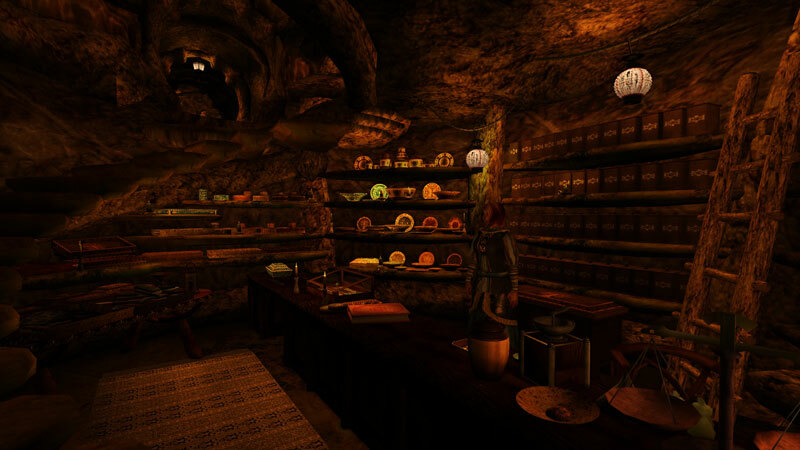 The Tel Mora shop also sells chocolates, new cutlery sets, and small portable display cases. The Tel Mora shop has magic muffins, baked daily. Many locals frequent the shop throughout the day. This mod adds 30 teas (including blacks, greens, and herbals) and 6 different coffees to the game, as well as a few tasty treats. Each is an ingredient with unique alchemical properties that can either be used in regular alchemy or brewed with a tea pot. Brewing requires no alchemical skill, only requires one ingredient, and gives you specific multi-effect potions with a milder effect than you can achieve with proper alchemy. 20 different tea sets are for sale, as well as a book about Tamriel teas, a ton of new trays, tins, jars, and other items to dress up your kitchen or alchemy lab. Version 2.0 also adds chocolates, honey, and a huge selection of new decorative items including a full set of bug-design ware, 12 new sets of cutlery, and portable chests and display cases. Requires tea and a teapot to brew it in. Cups are optional, but having them in your inventory allows you to brew potion versions for later consumption. You’ll get the cups back after drinking. Coffee must be ground before brewing. The coffee grinders for sale have to be dropped before you can use them. You can also use the permanent ones in the shops. All the teas are imported, so you won’t find any tea plants in Vvardenfell. Version 2.0 adds two shops to the game. Ebonheart: turn left at the dragon statue as you enter town and cross the bridge. You’ll find the shop on a little hill outside. Tel Mora: turn right at the docks, as you face town, and head towards the Convenant/Clothier. The shop is a little ways down the road, just outside town. You’ll also find a multitude of NPCs frequenting both shops, and a couple small quests. Most teas and other items are shipped in weekly if you deplete their stock. Rare teas and expensive items are shipped in monthly, and some rare items take three months to resupply. You can also make a special order on almost any item available in the shop, for a small shipping fee paid up front. 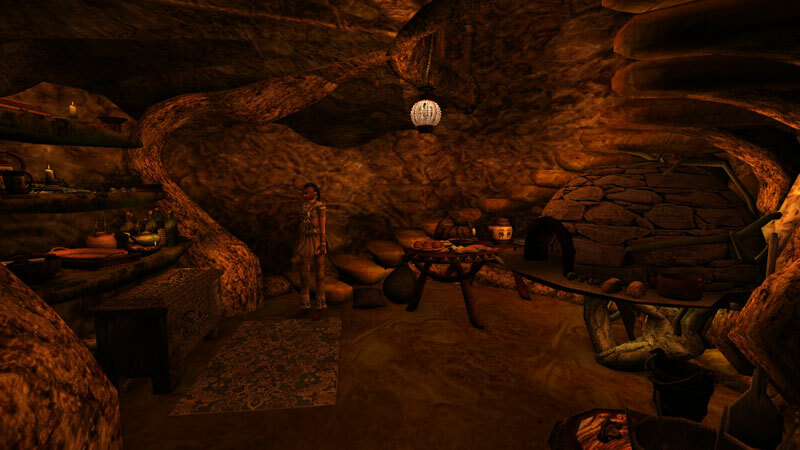 The Necessities of Morrowind compatiblity add-on adds tisane scripts to every tea pot, makes sure teas reduce thirst when consumed, and adds the requirement for fire and water to make teas. The tea giving add-on lets you offer tea to any NPC in the game. Ah, tea. The world would be a sorrier place without thee. Though I do love waxing poetic about the glorious Camellia sinensis leaf, this book will also cover coffees, herbal teas (or tisanes, as they like to call them in the East) and whatever else you can boil in water to produce a pleasant beverage of curious effect. In fact, most teas and tisanes are not only enjoyed for their flavor, but also have beneficial alchemical effects. In all teas, only the second and third alchemical property is infused with the boiling water. The most fascinating aspect of tea is it takes on different flavors and alchemical properties depending on where it’s grown, when it’s picked, and how it’s fermented and dried. It is quite unlike other herbs, which vary little in flavor or alchemical properties. It is hard to believe all the different varieties of tea come from the same plant. Different regions grow and ferment tea according to their cultural preferences, so in Akavir you’ll find mostly green tea, white tea in the Summerset Isles, and many shades of black come from Elsweyr. Though tea leaves have a rather unpleasant effect if eaten, when boiled in water only their beneficial effects are infused. On the whole, drinking tea is beneficial to body and soul. It only has one unpleasant side effect: it is a diuretic, which means (if I may put it so bluntly without my editor striking it out) that drinking too much can make you widdle yourself. When one thinks of black tea, one looks to Elsweyr, the largest tea producer in Tamriel. The favorite teas in High Rock, whether Wayrest or Riverhold, were all grown in Elsweyr. Just like Bretons, Khajiit have a marked preference for black tea, though a few green tea varieties are grown in their province as well. Tea is integral to Khajiit culture. It is shared in greeting, parting, and while conducting business. In fact, most business in Elsweyr is conducted while sheltering from the blazing sun in tea shops. Khajiit mostly drink chai, which is black tea boiled in milk, sugar, and local spices such as cinnamon, cloves, and allspice. They tend to like it even sweeter than your average ploughman’s cup, so if you’re traveling through the province, be prepared for funny looks if you ask for tea black, no sugar. Black tea is best steeped for up to five minutes. To get the perfect cup of tea, the water must be poured while it’s still boiling. Khajiit boil the tea in milk for ten to twenty minutes; however, this doesn’t damage the tea like boiling it for five minutes in water would, because milk has a much lower boiling point. Black tea is more oxidized than other teas, which is a fancy way of saying the leaf is allowed to wither before it dries. This results in a much stronger, darker cup of tea. It also keeps longer without losing flavor, which is why it’s the most traded type of tea in the world. Whole leaf teas are a much higher quality than cut or crushed leaves. However, crushed leaves often produce a stronger cup, which is why lesser quality teas like Wayrest Breakfast are some of the most popular. This humble tea was popularized in High Rock only two centuries ago, after the Empire gained enough stability to maintain safe trade routes across Tamriel. Bretons, like myself, have since enjoyed our tea as strong and black as we can make it–and with lots of milk. Though this tea’s alchemical effects are not particularly notable, it is quite refreshing. This second most popular High Rock tea mixes the fannings of Corinth tea with red currents to produce a slightly tart fruity sweetness. Needless to say, it doesn’t go at all well with milk. This black tea is the most traded in Tamriel, and forms the base for most flavored teas because it is cleaner tasting and less pungent than other varieties. Though many consider it a lesser tea because lower grades are exported in such abundance, the higher grades are much sought after by tea aficionados. This tea variety has a slightly nutty flavor and pleasant odor. 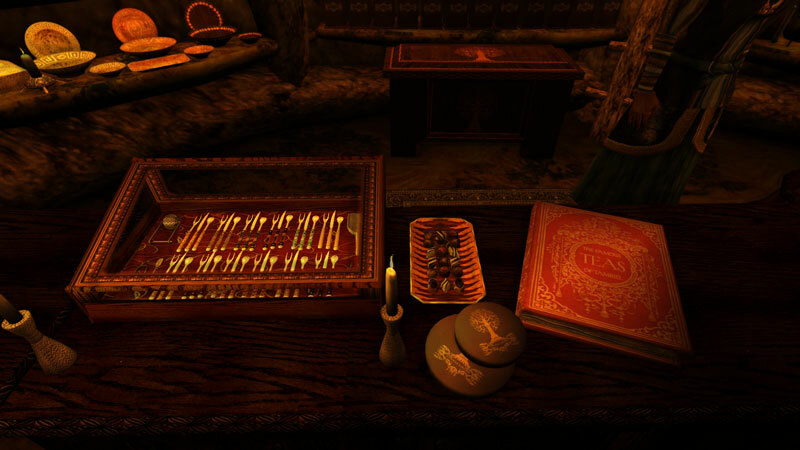 It is the preferred tea in many regions of Elsweyr, and higher grades are a favorite of tea aficionados around the world. Though most chai is homemade in Elsweyr, Orcrest exports a blend for ready consumption. Chai has only gained popularity outside the province recently, and is mainly enjoyed by Khajiit ex-patriots. This high grade tea is only picked once a year, when the tea first blossoms in spring. The white tips are the tea flowers. Though many similar teas exist, the Senchal Whitetip is the most famous fine tea in Tamriel because it was a favorite of Emperor Uriel VI. On a recent trip to Vvardenfell, I was introduced to some interesting new tea blends based on local flora. 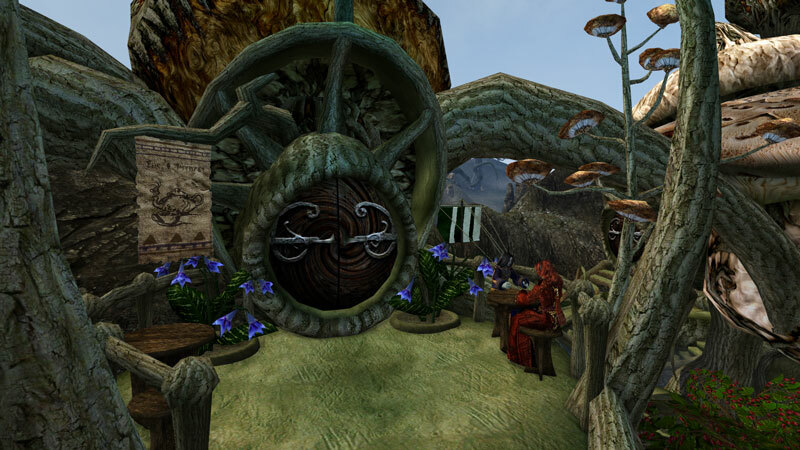 Though green tea has been grown for centuries in the Deshaan province of Morrowind, black tea has only recently been introduced to this little island. Though the following teas all use Corinth leaf as their base, the floral element adds some unique alchemical properties. Green tea is produced by drying the tea leaves before they’ve had a chance to wither. It produces a dark golden, sometimes greenish, cup with a light taste. Green tea is best enjoyed without much in the way of flavoring, though many fruit and floral blends are available. Green tea is prepared by pouring hot, but not quite boiling, water over the leaves and steeping for up to three minutes. Though black tea is far more popular in Tamriel, if we look beyond to Akavir, we find green tea comes out ahead in sheer volume of consumption. Akavir produces the finest green teas in the world, and it has been imported to Tamriel since the Imperial reign of the Tsaesci Versidue-Shaie. Though no man is allowed beyond Akavirian harbors, their harbors flow with riches. It is enough to temp many a trader to brave unfriendly waters. But first, let’s look at teas closer to home. 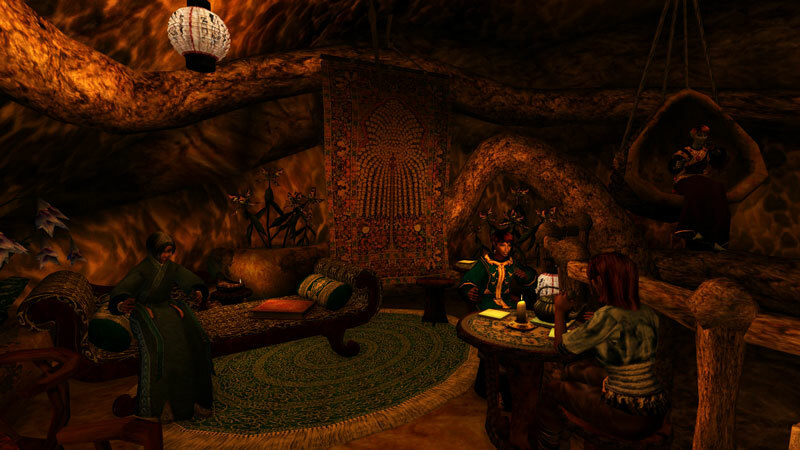 The Deshaan province of Morrowind is the largest producer of green tea in Tamriel. The plantations are run by the Dunmer Great House Dres. Though the tea plant was originally imported to Morrowind from Elsweyr, over the centuries the hardier Deshaan variety has been bred to survive the occasional blight storm blowing across the sea from Vvardenfell. As such, it has become disease resistant, and imparts some of that resistance to the imbiber. Deshaan Saltrice tea is a popular blend in the province. It combines the rich nutty flavor of roasted saltrice, a local staple, with the light vegetable flavor of the green tea. It takes on some of the alchemical properties of saltrice. 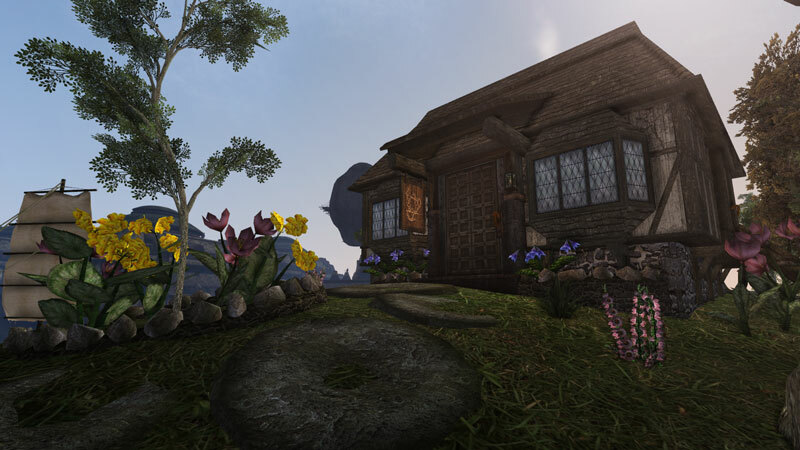 Willowflower green tea is the original willow flower tea blend from Deshaan, the black blend being a recent introduction with increased imports from Elsweyr. It takes on some properties of the willow flower. However, it’s ability to cure disease is not imparted into the brew. It can only be distilled through proper alchemical means. Jorval is the only region in Elsweyr that produces green tea. Oxidizing Jorval leaves reduces its poison resistance effect, which is much sought after by the province’s nobility as an assassination preventative. In Elsweyr, green tea is only valued for its medicinal properties because it does not take well to milk and sugar, which is the preferred way the Khajiit take their tea. Now we move on to the teas from Akavir. Though there are undoubtedly lesser grades produced, traders only bother to import the finest to Tamriel. All imported Akavirian teas have relatively rare alchemical properties which make them highly sought after by tea aficionados and alchemists alike. These slender green leaves are rolled sideways until they’re needle-thin before drying. This delicate tea cannot be steeped for long before turning bitter, but brewed properly it produces one of the cleanest tasting teas available. It is said both the Tsaesci and Ka Po’ Tun drink this tea to purify themselves before participating in honorable magical combat. This fine green tea powder is central to Akavirian culture. It is most often drunk when inviting guests into their homes. In Akavirian culture, a complete lack of trust between one another is so common, the implication of sharing a drink that cures poison is not offensive to guests in the least. The jasmine flower adds a delicate flavor and light fragrance to this tea. Legend says the Ka Po’ Tun invented jasmine tea during the first great war with the Tsaesci, who have a paralyzing bite. White tea is a lightly oxidized tea with a large ratio of tea buds. The term white comes from the white hairs on the unopened buds. The tea itself is a light golden color. It is only produced in the Summerset Isles, where it is grown for its magical properties. Apparently further oxidation would ruin these qualities, though it is mainly found in the buds and not the leaves. White tea has a delicate flavor, and is even more delicate when steeping. Though it can be steeped for many minutes, the temperature of the water must be significantly lower than other teas. They say this tea makes you feel as light as the clouds, and that’s quite literal. It’s distinguished by its pale golden leaves. Though the leaves are darker than the Cloudrest white, its bud are whiter, giving this tea a silvery appearance. They say this tea was created by the Psijic Order. Though tea is only grown along the southwestern border of the Black Marsh, it is an important trade item across the province, often taking the place of regular currency. Due to the harsh conditions of the region, the tea is heavily fermented and pressed into cakes or bricks to preserve them longer. Called Pu erh, it produces a thick black tea with a somewhat peaty flavor. Its flavor and aroma turns downright fishy if steeped too long. It also has a pungent aroma. Pu erh is prepared by pouring boiling water over the leaves and draining immediately to wash them. The boiling water is then poured again for the infusion, but is only steeped for half-a-minute or so. A similar method is used to prepare Oolong tea, which is another Black Marsh variety only grown in Soulrest. Black Pu erh is the most common form of Pu erh, for it keeps for much longer than the green variety. Green Pu erh is more sought after for flavor than black Pu erh, so it commands a higher price. Oolong Tea is a rich golden color, and has a delicate nutty flavor. It is brewed in a similar manner to Pu erh. Oolong lies somewhere between green and black tea in terms of oxidation. Reserved for the upper classes in the more civilized regions of Black Marsh, its trade is tightly controlled. Nevertheless, it is freely exported to other provinces in Tamriel, and even Akavir, where it apparently traded for green tea and considered a rare foreign delicacy. It is perhaps for this reason that it is less available to the native Argonians who produce it. Both the Argonians and the Khajiit share a saying: “Money does not grow on trees. It grows on a bush.” Since the Empire’s demand for Oolong tea has grown, the Argonian’s Oolong tea ceremony is becoming a dying tradition. This bitter bean is somewhat of an acquired taste, but many people have acquired it because it’s a surefire pick-me-up. It is only grown in three regions: Corinth in Elsweyr, Skaven in Hammerfell, and the Island of Cespar off the Hammerfell coast. It once grew in abundance in the Dragonstar Mountains, but a freak frost wiped out every crop a century ago and attempts to replant them have not yet been successful. A similar incident happened to the island of Vvardenfall in the First Era. The volcanic region of Red Mountain was once ideal for growing coffee, but the Great Blight destroyed every plantation. The Dunmer have since lost their taste for coffee because they can’t easily get it. Though coffee beans can be eaten whole, it is more often preferred as a beverage made by grinding the beans and pouring hot water through the grounds. Unlike tea, it only takes the water the briefest encounter with the fresh grounds to produce a thick black liquid. All coffees are imbued with their first three alchemical properties when brewed. It’s last alchemical property, a nasty rebound draining of fatigue, sometimes manifests itself as a long aftereffect. Coffee has similar properties to moon sugar, and can be just as addictive. The Corinth region produces a small Arabica bean. In Elsweyr, coffee is considered a dessert drink, and served thick and strong with plenty cream and sugar. It’s a good thing the Corinth bean is not as strong as its Hammerfell counterparts, or the Khajiit would be bouncing of the walls after drinking it. Corinth coffee beans are either lightly roasted, or fully toasted. The roasting process not only strengthens the coffee’s flavor, but also slightly alters and increases its alchemical effects. The Skaven region produces two varieties of coffee bean. The golden arabica, though a flavorful bean, is not as strong as the red variety. Overall, the golden bean has a more pleasant effect on the imbiber. Drinking too much Skaven red tends to make people intemperate. Skaven coffee is brewed far weaker than other coffees because of its natural potency. Unlike in Elsweyr, coffee is considered an everyday drink in Hammerfell. The island of Corinth is the only place where you’ll find the robusta bean. This coffee has a stronger flavor than arabica, and an earthy taste. Though not as popular as other coffees, those who enjoy it swear by it. It is typically brewed thick and strong, in tiny cups, with liberal amounts of cream and sugar. Even in small quantities, this coffee with either make you jumpy, or hover above the ground. A great variety of herbal infusions exist across Tamriel, but only a few have a pleasant enough flavor to become popular beverages. Much like tea, infusing these herbs only imbues the liquid with the second and third alchemical properties, which is a good thing because many of these herbs are harmful if eaten raw. Most herbal teas can be brewed as long as you like unless otherwise indicated. This tiny yellow flower grows across High Rock and Cyrodil, and is the Breton’s second most popular non-alcoholic beverage next to tea. It has a slight apple-like aroma and a natural sweetness. This rock-hard tuber grows all over Tamriel. When crushed and infused in boiling water, it produces a dark beverage that resembles black tea. However, it tastes nothing like tea. It has a sharp bite, and if you brew it too strong you might feel like it’s set your tongue on fire. If you brew it too long, the deep poisons in the canis root begin to leach into the tea. It is rather an acquired taste. The hibiscus flower grows in hot, humid regions across Nirn. This beautiful red jungle flower has thick fibers idea for making rope, and its flower petals are the most flavorful of any plant in the world. The tea produced from brewing hibiscus petals is a deep red. Its flavor is a rich mixture of tartness and sweetness. 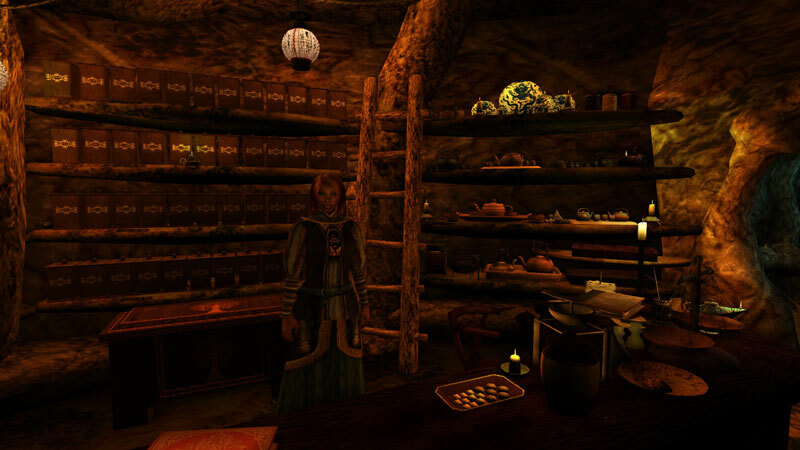 It happens to be a favorite beverage among Altmer, for it lends them a resistance to Magicka, of which they possess a natural weakness to. This herb is a popular flavoring in food among the eastern provinces. It is quite edible raw, though it tastes better fresh. Dried lemongrass can be brewed into a tea that possesses a light tartness. Its taste, like its name suggests, has a slight resemblance to lemons. This herb has a taste as fresh as the breath of winter, and a natural sweetness. It grows in abundance in Valenwood and the Summerset Isles. However, the Valenwood variety is not available for consumption. Anyone caught picking this plant in Bosmer territory would instead find themselves brewing in a pot. Redbush is a native scrub of Hammerfell, primarily grown south of Skaven. Known locally as rooibos, the small spiky leaves of the redbush make a deep red tea with a peculiar, though pleasant malty flavor. It is oxidized in a similar manner to tea, which turns the leaves a deep red color. Redbush tea takes well to whatever flavors you can throw at it, so it is available in many fruit and spiced blends. It also mixes well with milk, sugar, honey, or lemon. Drinking redbush fortifies health and increases elemental resistances. This plant is related to the redbush plant, but its leaves are flatter than its spiky cousin. It mainly grows north of Janeth, and in fact, that is only place in the world where it is harvested. As the name suggests it has a natural sweetness. Though tea-making is akin to alchemy, it requires little skill to make, meaning anyone can enjoy the benefits of a good cup of tea. With the aid of this book, you’ll soon be brewing your own tea to perfection.